First of all, I really like that they are in Camden. Yes I would have loved for them to stay closer to my house but Camden is the home of the Alternative, and Reptile is just that. It now takes places at the Kolis club which is right outside the station, so it is convenient to say the least. We arrived shortly after 10.30pm and there were only a few people ahead of us in the queue. The new venue is divided into two floors, which means that Reptile is now bigger than before. Downstairs there is a stage, a bar and cosy dance floor, at the back it leads to the smoking area which is a cool industrial space which I think would be amazing space for an underground rave. Upstairs there is another bar, along with a small dance floor. I would say that the overall space is cosy but it never got really crowded so it worked perfectly. The people (which for me, is what makes the night) were as expected – a friendly bunch. There were your usual familiar faces but also quite a new faces I haven’t seen before. The music was too loud for conversations, but I did end up dancing with a few friendly strangers! There were a lot of newbies as well which is nice to see, because as I keep saying – GOTH IS DYING! The music was a bit weird, if I am honest. It was supposed to be 80s/Goth upstairs, with industrial/metal downstairs but it all ended up being a real mix. There was nowhere as much goth upstairs as expected which I didn’t mind as I am not a true goth (I am more of an industrial chick) but Jake definitely is and I did see a few goths looking grumpy about the song selection. Downstairs was also a bit random, they were playing really good songs but there was no flow, so you had System of a Down followed by The Chemical Brothers for example which it simply didn’t flow. The good thing about the space being compact was that I was able to go up and down and follow the best songs around so again, I am not massively complaining here. So, was the night as good as it was back in its Archway home? It certainly was – yes, the music could be improved, but I think they are still trying to figure it out, as having two floor obviously changes the dynamic of the space. 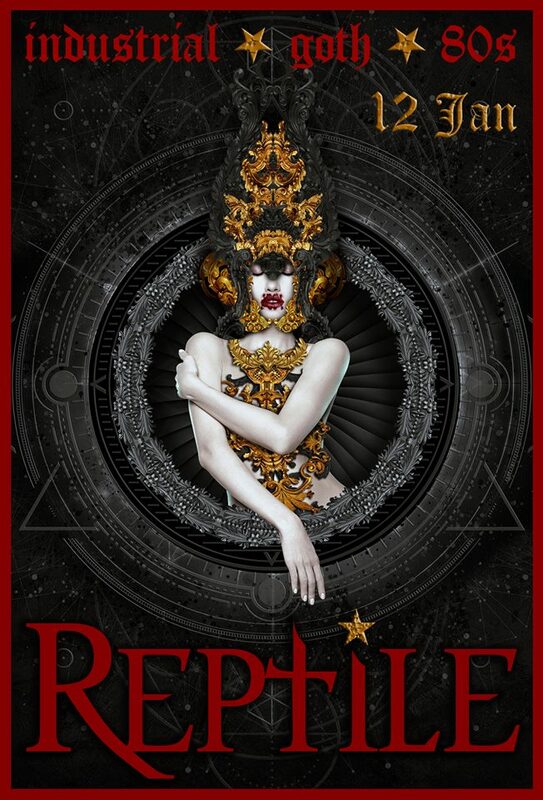 Reptile is still is by far one of my top choices when it comes to nights out in London. Besides, it costs only £7 to get in and drinks are also not badly priced – so given the location, this is a no brainer. Reptile – you did it again!